The documents in this collection were used by Ms. Saunders for her research of the book, Lady Between Two Worlds: Ellen Axson Wilson. There is a wide variety of information and document types, which include letters, pamphlets, encyclicals, church service bulletins, photographs, selections from other books, selections from other collections, and receipts. Some of the most interesting documents in the collection are the original letters between Margaret Axson Elliott and various individuals concerning her book, My Aunt Louisa and Woodrow Wilson. These letters even include a letter from 21st Century Fox Movies concerning the creation of a movie based on her book. Another interesting set of documents are the letters between Frances Wright Saunders and William Dearing Hoyt, II, a descendant of Ellen Wilson, who gives interesting insight into the family’s history. 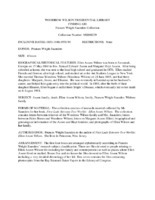 The collection mostly focuses on Ellen Wilson’s life, history, and genealogy, and contains records of documents between Ms. Saunders and various correspondents. Most of the collection is composed of reproductions, and the fourth box consists almost entirely of reproductions from the Ray Stannard Baker collection found in the Library of Congress. This collection offers a wide array of historical information concerning President Wilson and Mrs. Wilson’s public and private life. The majority of the collection focuses on Mrs. Wilson and her family.